When in San Francisco, don't miss an opportunity to ride the Cable Care - heritage cars that are reminiscent of a bygone era. Cable cars, also known as tramways are public transit vehicles that run on rails The World's fist cable- powered street railway was built in San Francisco. The man behind SFO cable car was Andrew Smith Hallide, who tested the first cable car on August 2nd 1873. The first cable car in San Francisco descended Clay Street on Nob Hill and was an excellent system to traverse the steep roads of the city. The idea for a steam engine powered-cable driven rail system was conceived in 1869 and was later adopted in many other cities in the U.S. During the late 1880's almost all the cities in the U.S replaced their cable cars with electric streetcars. 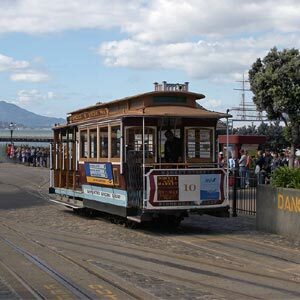 However, San Francisco continues to retain it and is perhaps the only city in the world to operate cable cars. Cable cars in San Francisco were nearly on the way out in the late 1940s. But due to the popular campaign led by Mrs. Friedel Klussman, the quaint cable cars were back on the streets. Currently San Francisco has 28 Powell St cars and 12 California St cars, maintained by SF Municipal Railway (MUNI). The California St line cars are double open-ended and run from Drumm Street (near Market Street) to Van Ness Avenue. This type of cable car has been around since 1891 when California Street Cable Railroad began to replace their 2-car trains. On the other hand, the Powell St cars start at Powell and Market Street. The Powell-Mason line cable cars run generally north to the Bay and Taylor Streets via Powell, Jackson (return via Washington), Mason, Columbus and Bay Streets. The Powell St cars also have another line Powell-Hyde line that runs north and west to Hyde and Beach Streets vial Powell, Jackson and Hyde Streets. Both these lines are single-ended cars that can operate in only one direction. Follow the color codes- yellow sign indicates cable cars heading towards Bay and Taylor streets while red signs head towards Aquatic Park. Cable cars in San Francisco operate on all days from 6:30 am to 12:30 am.